Sometimes you have to look closely, but rock face block, also commonly referred to as rusticated concrete block or ornamental concrete block, can be found on historic homes and buildings all over the United States and Canada. Around the turn of the 20th century there was a dramatic shift in architectural style from the Victorian era to the modern era. Builders and architects also began experimenting with new and cheaper materials to combat the rising costs of lumber and brick, and the scarcity of natural stone. Concrete blocks were found to be cheaper than natural stone and even cheaper than brick, especially in smaller communities where brick had to shipped long distances. Concrete block was also stronger than brick, lighter than natural stone, easy to make, and much more affordable. Concrete blocks were first manufactured in England around the 1850s and are first seen in use in the United States around the 1880s. The first patent for a concrete block was granted to C.S. Hutchinson in 1866. During the 1890s Portland cement, a key ingredient used to make these blocks architecturally sound, became readily available across the US. 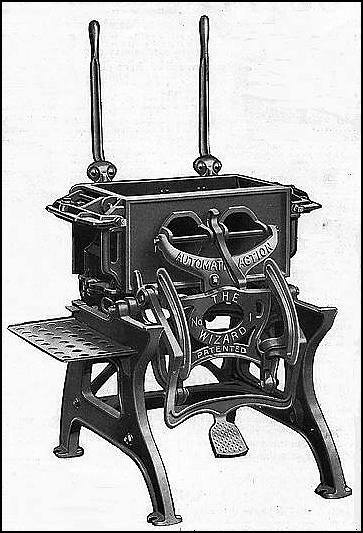 Shortly thereafter, Harmon S. Palmer created the first block molding machine in 1900, making it quick, easy, and inexpensive the produce these blocks. It isn’t until this time that you really see this building material really take off. Shortly after Palmer patented his machine, dozens more were developed and sold by companies across the U.S. Some of the biggest manufacturers of these machines were Sears Roebuck & Company, Ideal, and Palmer. These new machines were so easy to use they allowed anyone from a skilled mason to a farmer to make their own concrete blocks. Sears marketed their machines (the Wizard, the Triumph, and the Knox) through mail order catalogs to both professional builders and to the many do-it-yourself home builders of that era. Sears also encouraged use of the blocks by including them in their famous Kit Homes. And block machine manufacturers didn’t stop there, they continued to creating new, more elaborate designs including details such as scrolls, flowers, and wreaths. During the early 1900s the bungalow and American foursquare style homes were the latest architectural trend. You will find rock face block most frequently on these styles of homes, especially on the foundations. You will however see this block on early 1900s Queen Ann homes, mission-style homes, Greek Revival styles, and many more architectural styles around the country. By the late 1930s a more modern look of smooth face concrete block came into style. The invention of large automated block machines that could only produce smooth-faced block also pushed builders to use this now cheaper design. By the 1940s, use of rock face block was almost non-existent. Many of the machines were eventually scrapped for metal during the Great Depression and WWII. Over the years these blocks have also been covered with siding, stucco, and cement coatings, and many of these unique houses and buildings are hiding in plain sight!